October 26th, 2017 : The SMILE Cafe celebrates its 5th Anniversary since opening! On that day, while stocks last, the SMILE Cafe will be offering free teas / coffees and cakes and pastries! There will also be live music provide by The Green Elastic Band, with melodeon, flute and guitar. The popular SMILE Cafe is a community cafe, manned by volunteers, and is self-sustaining.It provides everything from it's famous all-day breakfast for £3, porridge with honey for £1, bacon rolls and hot dogs for £1.50 and light lunches eg baked potatoes with various toppings, as well as various 'toasties' and panninis. - for the third time! Folowing an inspection by the Food & Safety Team from the Suffolk Coastal District Council, the SMILE Cafe has again been rated 'very good' and awarded the maximum 5 stars.. The law requires that food businesses and other premises where food is handled or stored are registered with or formally approved by the local authority. The food hygiene rating scheme is run by the Food Standards Agency in partnership with local authorities in England, Wales and Northern Ireland. The inspectors will check if the business produces food that is safe to eat. To do this, they will look at: the premises, the kinds of food made or prepared, how the business works the the food safety management system. For more information, click here, or contact the environmental health service at Suffolk Coastal District Council for advice. The pop-up SMILE Café operating 10am – 2pm, every Thursday, at the Fromus Centre, Saxmundham has recently launched a new conservatory extension, and Nick Corke, Rotary Club District Governor, was on hand to cut the ribbon and usher in the expanded seating, providing visitors with a view of the local flora and fauna while they enjoy their food and drink. 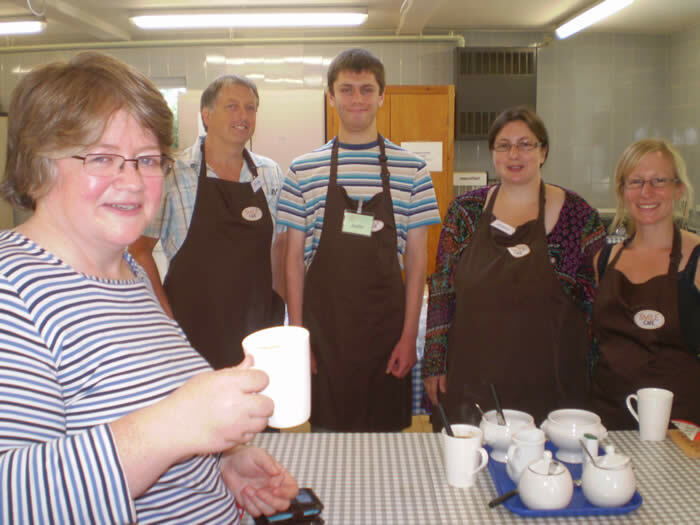 “It’s good to see the successful Smile Café expanding and catering for even more customers. It’s a great example of PASTEL and the Rotary Club working together to provide a local community solution to a local community issue” said Nick Corke. 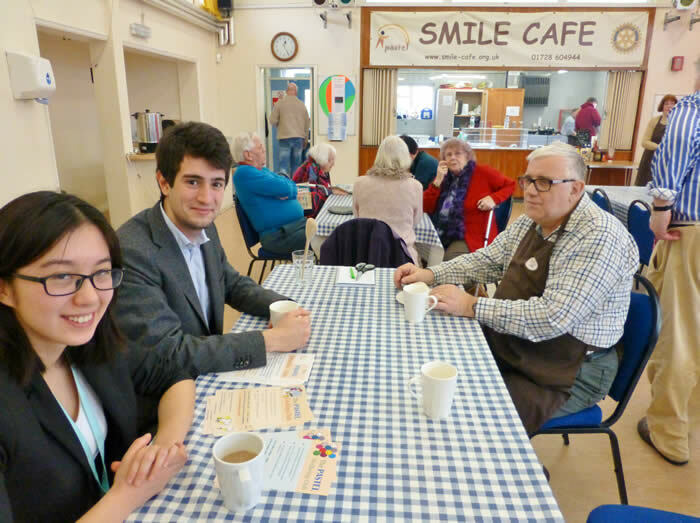 On the same day, two medical students, Betty Xu and Karolos Dionelis - in their fifth year of medical studies at Cambridge University - opted to drop in and meet with SMILE Café customers and volunteers. 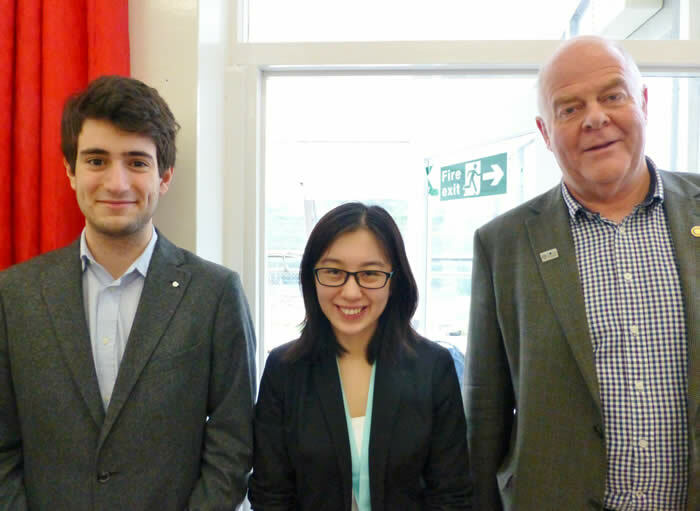 They are both on a short stay, as part of their studies, with the Leiston Surgery - a local GP practice with a strong interest in medical education, being an accredited centre for training GP registrars, as well as undertaking a rolling training programme for medical students from Cambridge. Both students have an interest in psychiatry and were keen to know how the SMILE café helps to reduce social isolation and provide a welcoming oasis for those seeking some relaxation, a chat and sharing emotional support with others. So, with coffee in hand, they circulated to find out more. “I think the SMILE Cafe has a really wonderful atmosphere – warm and vibrant. Doctors are very good at treating those who are really ill but, afterwards, the community can really help them ‘get back on their feet’. The SMILE Café is an excellent model and obviously very successful,” said Betty Xu. “Social isolation is a big issue and can leave some people with a lack of purpose. In the SMILE Café people can meet and chat, which can greatly improve both their physical and mental wellbeing. GP’s allocate appointments as 10 minute slots, but at the SMILE Café you can sit and chat for well over an hour…” added Karolos Dionelis. “I live alone and look forward to my once-a week visit to the SMILE Café to meet others and share life’s experiences” Janet, SMILE Café customer. For further information about this event, pleasse click here. 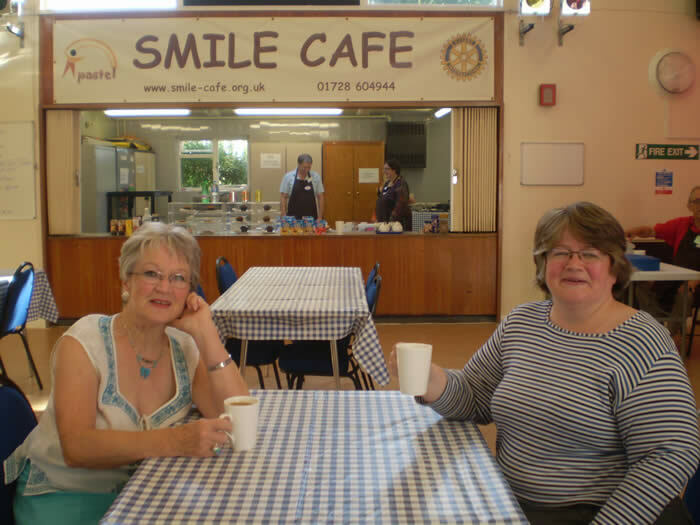 The SMILE Cafe was set up on October 4th, 2012, by the PASTEL Community Interest Company, with support from the Rotary Club of Saxmundham & District.It was sponsored by both organisations and became self-sustaining within the first year. 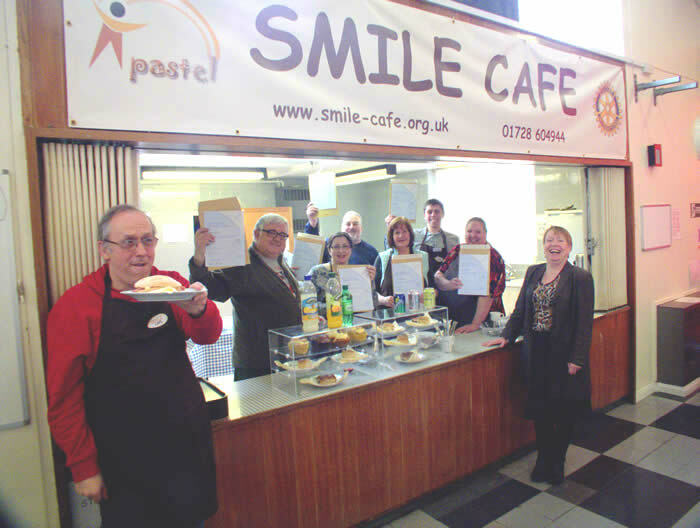 The SMILE Cafe was managed by PASTEL for the first two and a half years, from October 2012 to April 2015, when the roles were reversed and the management was handed over to the Rotary Club, with PASTEL in suppot. On Thursday March 12th, Nick Hulme, CEO of The Ipswich Hospital NHS Trust, popped into the SMILE Café in Saxmundham, with his colleague Sarah Higson, the hospital lead on the Patient Experience initiative. They were there to chat with SMILE Café customers and learn about any specific issues or difficulties they had accessing health services at Ipswich Hospital. Nick and Sarah spoke to a mix of customers who appeared fairly happy with the hospital in general but had some particular complaints about what they saw as unnecessary journeys to the hospital for minor matters that they felt should be dealt with by local GP surgeries. “It’s really important to listen to our patients and communities so we can aspire to improve further. 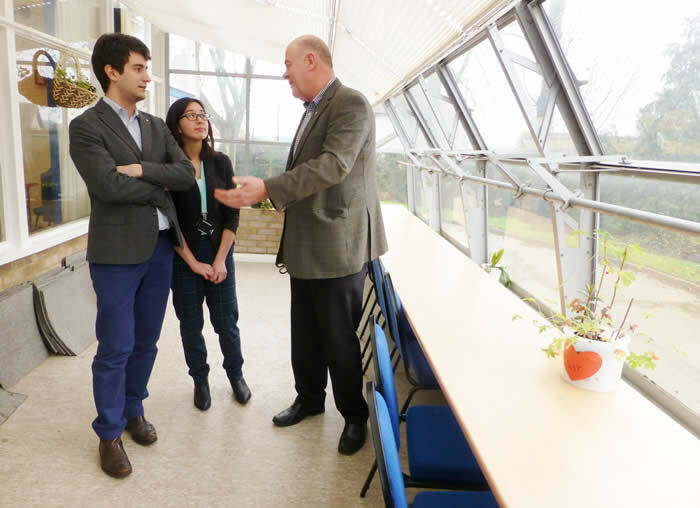 And, I’ve been very impressed with the amazing community resource that is the SMILE Café.” Nick Hulme, CEO of The Ipswich Hospital NHS Trust. For more information on the Patient Experience initiative, visit the website: www2.ipswichhospital.net/microsites/patient_experience . On Sunday November 17th, between 11am and 2pm, PASTEL will be hosting a Sunday Brunch fundraising event, at the Fromus Centre, Saxmundham. Visitors will be able to drop in, relax with the Sunday papers, chill out with live ambient music from TALC and savour special hot dogs and premium burgers accompanied by soup, coffee, tea, soft drinks and cakes. There will also be an XBox Tenpin Bowling Competition and Grand Raffle with many prizes. The event is being held to raise funds for PASTEL who have been actively supporting vulnerable and disadvantaged people - living in rural East Suffolk - with personal development and social activities, since 2005. PASTEL is a social enterprise, founded by parent / carers and managed by volunteers. 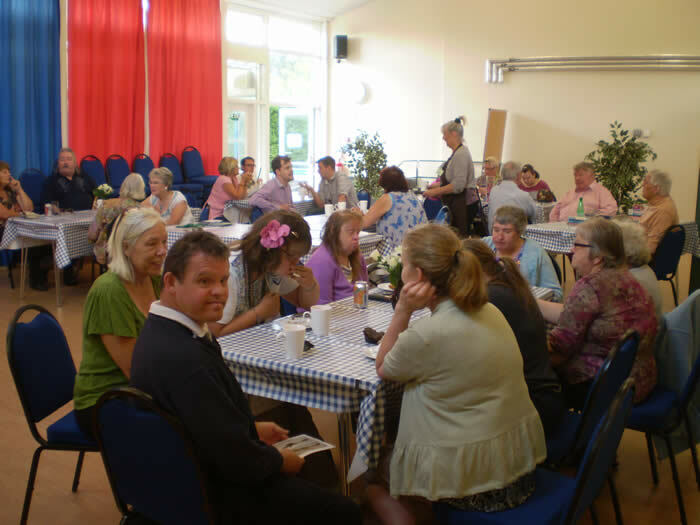 The SMILE Café was launched on Oct.4th 2012 - as a weekly pop-up cafe, running every Thursday from 10am to 2pm, at the Fromus Centre, Saxmundham. 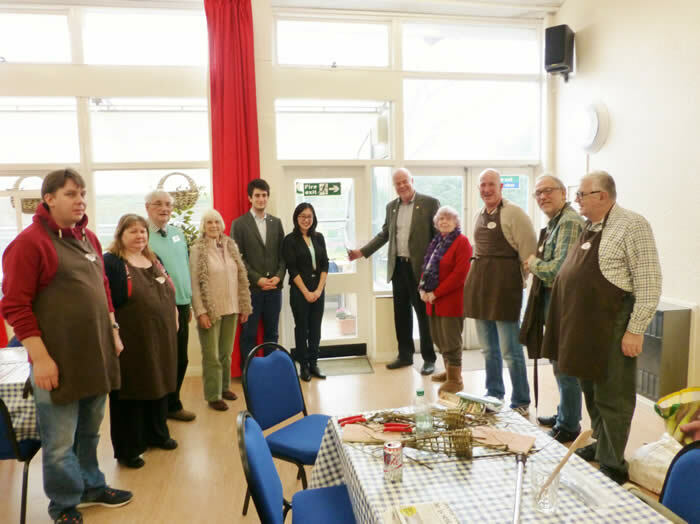 It aims to provide a respite break and reduce social isolation - primarily for Carers and vulnerable adults, as well as those just in need of some company in a warm and friendly environment. 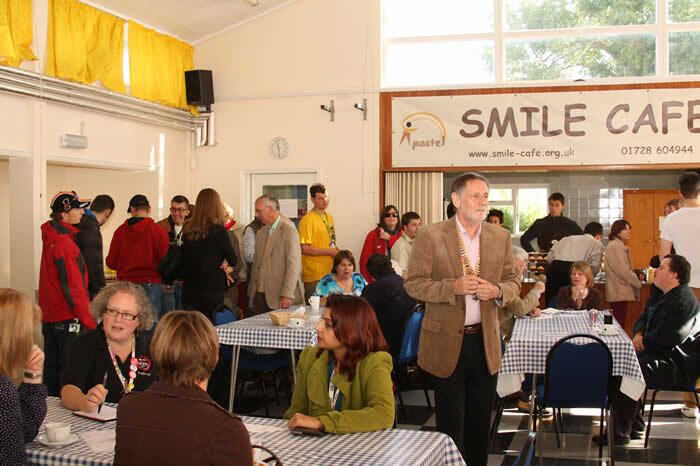 The SMILE Café is run by volunteers. Since then it has received many visitors, some as regulars, and has clocked up over 1,000 volunteers hours. To celebrate the success of this venture, and in recognition of the team of volunteers who have made it happen, the High Sheriff of Suffolk, Sir Edward Greenwell, Bt, DL.joined the volunteer awards ceremony and personally handed out certificates to those volunteers on duty at lunchtime on Thursday,Oct.24th..
Sir Edward was joined by the Saxmundham & District Rotary Club who also took the opportunity to add their appreciation of the volunteer work in the community. Dr. Therese Coffey, MP, takes a break to chat to carer, Linda, and some of the of SMILE Cafe volunteers, David, Justin, Jenny and Kerry, at the beginning of another pop-up appearance of the SMILE Cafe at the Fromus Centre. Following a thorough inspection of our Food Safety Management System and working practice of our dedicated volunteers, the SMILE cafe has passed with flying colours. Well done to all our volunteers for maintaining such professional standards! March 1st : Bacon Rolls all round, as 8 volunteers successfully complete their food safety training! The SMILE pop up Café now has an expanded menu to include toasted ham and cheese sandwiches, smoked bacon in Ciabatta rolls and jacket potatoes with a variety of fillings, as well as a range of hot soups in a mug. This has been made possible because a group of volunteers successfully completed their Chartered Institute of Environmental Health Level 2 Award in Food Safety in Catering, achieving a 100% pass rate. They were awarded their certificates at the Café on 4th April, which also marked the launch of the café’s new menu. Helen Meneghello of HM training dropped in to present the 8 successful volunteers with their nationally accredited certificates and celebrate their achievement. To view the new menu, please click here. Following a day's training, eight SMILE Cafe volunteers sat the hour-long Chartered Institute of Environmental Health Food Safety exam - and all eight passed. Congratualations to all! They are all now proud possessors of the nationally recognised Level 2 certificate. On Thursday February 28th the High Sherriff of Suffolk, and his wife Karin, popped into the SMILE café for a coffee and chat. This visit was part of a year-long quest to meet individuals and groups who voluntarily devote their time and energy to improve the communities in which they live, and make Suffolk a better place to live. 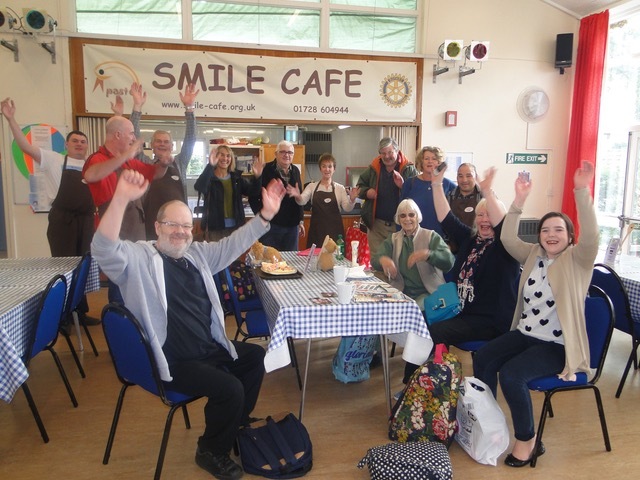 On January 31st the SMILE café hosted a visit from John Minhinick, President of Rotary International in Great Britain & Ireland, who came to see the good work progressing. The Rotary International in Great Britain and Ireland (RIBI is the association of Rotary clubs within England, Ireland, Wales and Scotland, comprising 53,000 members - men and women of all ages and backgrounds - in 1,850 clubs. December 1st: SMILE Cafe Christmas Specials! The pop-up SMILE Café has two special days lined up for December. On the Thursdays of Dec.20th and the 27th, not only will the SMILE café be open from 10am to 2pm, at the Fromus Centre in Saxmundham, but it will be offering a variety of free teas and coffees. In addition, there will be live entertainment, board games and a café quiz, - along with the usual selection of delicious handmade cakes and buns! 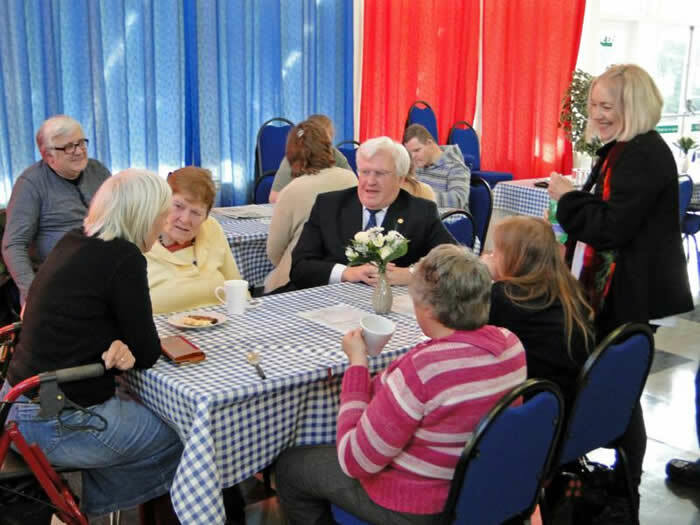 The SMILE Café is aimed primarily at Carers, and their families, but everyone is welcome that feels in the need of some company or just wants to take a break and a chat, in a welcoming and friendly oasis. Unfortunately, many people do not see themselves as “Carers” and yet there are over 75,000 in Suffolk and the number is growing rapidly, as people are living longer. A “Carer” is a person of any age, who without being employed as such, cares for another person who needs ongoing support because of dementia, a learning disability, a long term medical condition, a mental illness, a physical disability, frailty or the need for palliative care. A Carer may or may not be a family member and may or may not live with the person. For October the SMILE cafe was chosen by Waitrose to go forward into its Community Matters scheme. There was strong support for the SMILE cafe and Waitrose were able to present a cheque for £600. October 4th: A Resounding Success! On the first day of opening, over 100 customers streamed into the SMILE Cafe in the first 3 hours! After all the hard work put in by a small, but determined, band of wonderful volunteers the venture was declared a great success by all attending - please click here to see what customers had to say in their own words. We would like to give a special vote of thanks to Sharon and her team from Coastal Caterers (www.coastalcaterers.co.uk) who provided a range of complimentary canapes and their own staff to pass them round and, in so doing, took some of the strain of accomodating so many customers. The challenge now is to reach out to all those people, in this rural part of East Suffolk, who are experiencing varying degrees of social isolation and let them know that there is a friendly and welcoming oasis in Saxmundham - a place to relax, unwind, meet and chat with others in similar circumstances, and also have the opportunity to meet professionals to gain valuable information, advice and guidance. Please help to spread the word - we're here to help! The SMILE cafe will be launched at the Fromus Centre, Saxmundam at 11am on Thursday October 4th, 2012. The SMILE Cafe will managed by PASTEL. 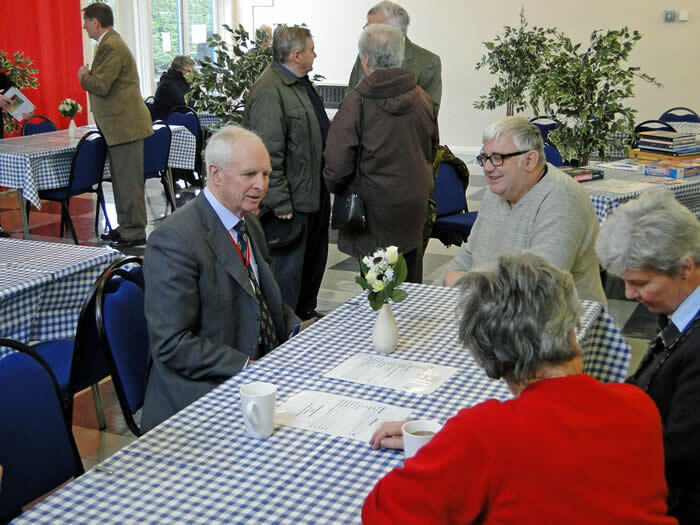 The Rotary Club of Saxmundham & District will provide seed-corn funding, equipment, tableware and back-up expertise. PASTEL is currently recruiting and training volunteers to staff and help run the cafe. The project is financed by both PASTEL and Rotary, with additional funding received from the Saxmundham Waitrose superstore and EDF Energy.